Everyday Art: Hooded Towel Patterns - Giveaway!!! Did you know we're now on Facebook, Twitter, Pinterest, Etsy and Flickr? 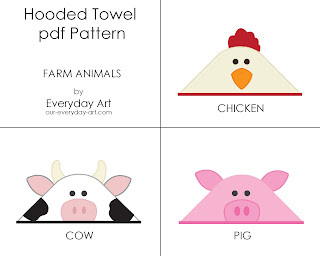 I can't tell you how excited I am to FINALLY be posting these patterns! The project ended up taking me a lot longer than anticipated and was a lot of work (probably because I got a bit carried away and kept making more and more patterns) BUT it was worth it. I love this little tiger, he might be my new favorites. And who doesn't like a puppy? 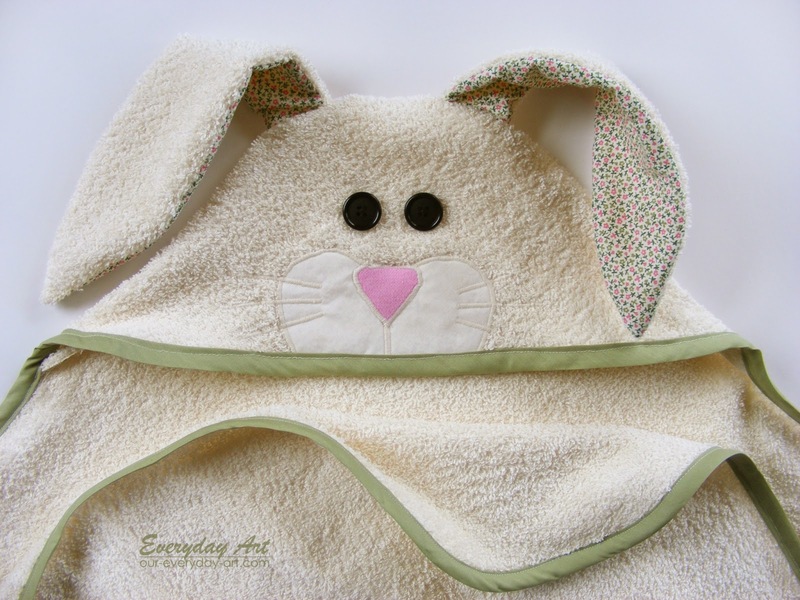 Or what would be cuter in an Eater basket than a soft cuddly bunny towel? 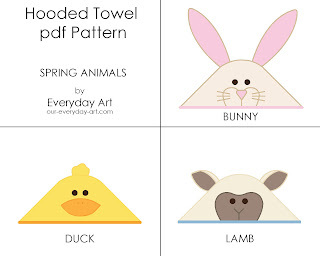 There are sooo many hooded towels for sale out there. I love them. KIDS love them. But I feel like most are way over priced. So I did what I usually do when that happens and went to work making my own. 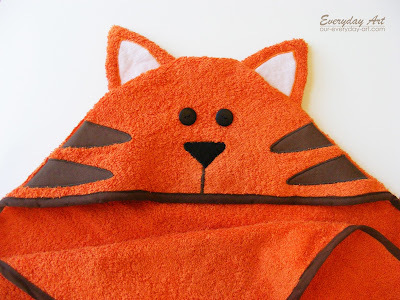 I've been making these for a few years now and have been asked several times to help friends make there own, which got me thinking... maybe there are MORE of you out there that would like to make your own, but just need a little help. So I made a pattern, and another, and another, and just couldn't stop. 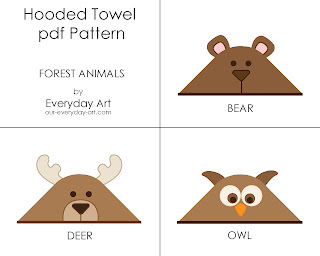 I love making these towels because they're easy, affordable, and fast. I can usually complete a towel in about 2 hours. (Less without interruptions :). Sometimes I make a few at a time and save them for baby gifts. Then when the time comes I just pick one, tie on a ribbon, and I'm ready to go with a cute, hand-made, one of a kind gift! 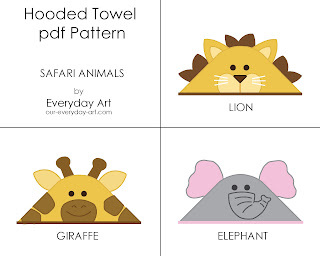 Here are all the patterns! You can check them all out in our Etsy Shop. Enter our giveaway to win the pattern of your choice. 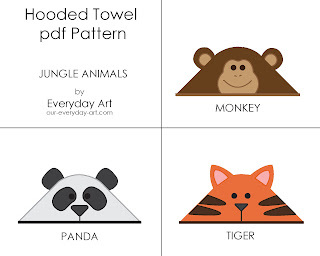 Backyard Animals, Farm Animals, Jungle Animals, Safari Animals, Spring Animals, or Forest Animals. The tiger is my favorite, too! 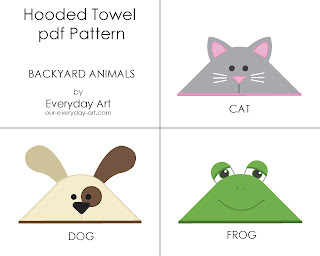 They are all cute but my favorite would be backyard animals - the frog. This pattern truly celebrates childhood as its best! They are all so cute! I really like the lion. These are adorable! I like the jungle animals and the spring animals. I think these would make great baby gifts, as you mentioned! Right now, I'm loving the tiger. So cute!